We are very lucky to be going on another tour. This time we are going to explore Far North Queensland and right up to the tip of Australia and Thursday Island. 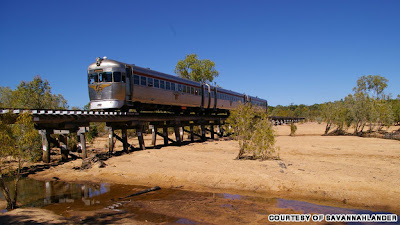 Tomorrow we fly to Cairns (3hrs) where we stay overnight then we are doing a 4 day trip on the outback train "The Sevannahlander"which goes inland from Cairns. 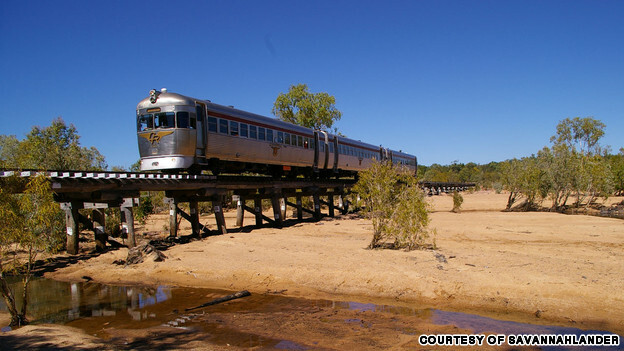 Each day we leave the train for a guided tour and to sleep overnight and then we board the train again for the next day. 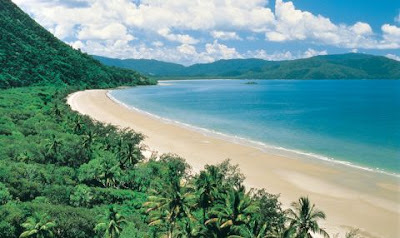 Then we return to Cairns for another 2 days including tours. Then we join an APT tour in a four wheel drive bus/truck and travel up to the tip of Australia through 'Crocodile Dundee" territory. It is very remote and rugged. There will not be much internet service so you will have to wait until I return to read about our adventures. Although Bill has done a scheduled post for each day to show you where we are. I think he has used brochures and the web to illustrate where we are. Where the rainforest meets the sea. 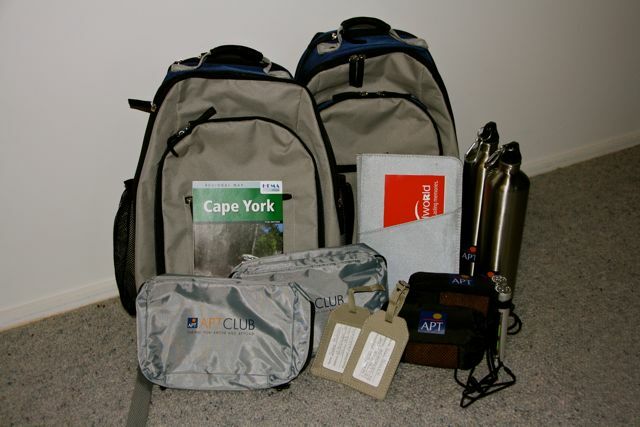 packs, toilet bags, towels, torches, drink bottles, bag tags, wallet and map. Sorry that I wont be visiting you all for 3 weeks unless we get service for the iPad. We have made it to 44 years. We were married in Pt Moresby, P/NG and we do not have any decent wedding photos the photographer was hopeless. However, we have our memories. on Ela Beach in Pt Moresby. 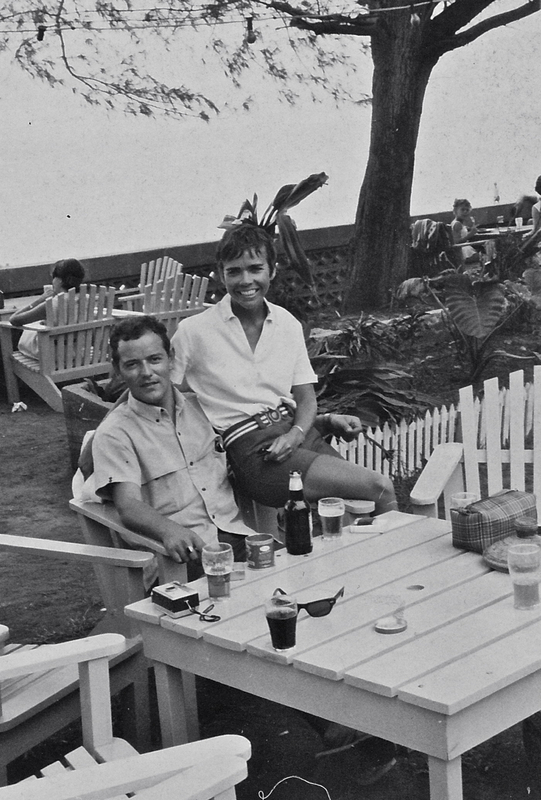 I was so happy to have met this cute young man with a Swiss accent in November '68. We were married 6 months later, friends said it wouldn't last and here we are 44 years later still going strong. The wedding reception at The Purple Parrot Restaurant. Hee hee is that a prawn cocktail I can see-sooo 6o's. 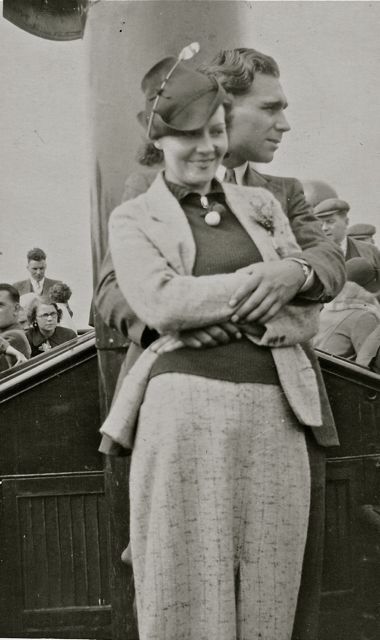 My mum and dad started smoking in the 30's. It was supposedly very fashionable to smoke and my mum was very fashionable. During the war smoking was claimed to calm the nerves. My parents lived in London and often had to rush to bomb shelters at all times of the day and night carrying two little children. I can see how they both got hooked on smoking. A habit they wanted to ditch in later years but found it very difficult. It wasn't until they were in their 60's and 70's that they managed to quit. When I was going through my mum's belongings after she died I found this old cigarette tin with buttons kept inside. I nearly threw it away until I thought this looks like a really old tin so I removed the label she had stuck on it and kept it not really knowing what to do with it. Now I can use it for Sepia Saturday's meme about cigarettes etc. 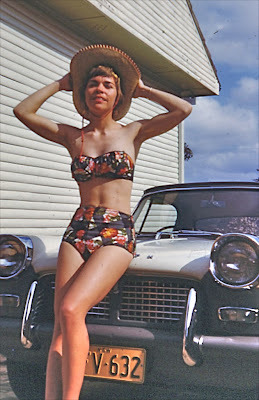 My guess is the tin of cigarettes was purchased in early 50's. 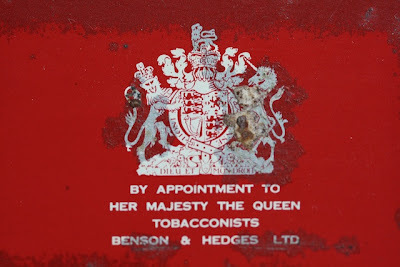 An old Benson and Hedges cigarette tin. Benson and Hedges was founded in 1873 by Richard Benson and William Hedges in London. 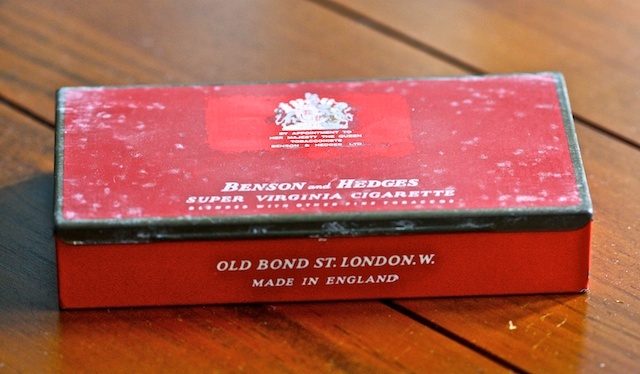 The business was formed to supply cigarettes to Albert Edward who at the time was Prince of Wales. The partners were successful, and in the early 1900s started to market their product in the U.S. and Canada.Of particular honour was that the company was issued a Royal Warrant in 1878 to supply their product to the Royal Family. Due to limited demand in the royal family, Benson and Hedges's Royal Warrant was revoked in 1999. The removal of the crest was greeted positively by anti-smoking groups as a step of reducing cigarettes claim as a legitimate product. 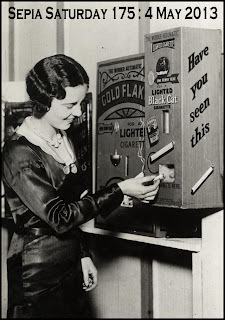 This is a cigarette vending machine dispensing lit cigarettes. See more by clicking on the image. Today our friends, Joan and Norm, asked us to meet them in the city as they had to come in from the country town of Esk for an appointment. 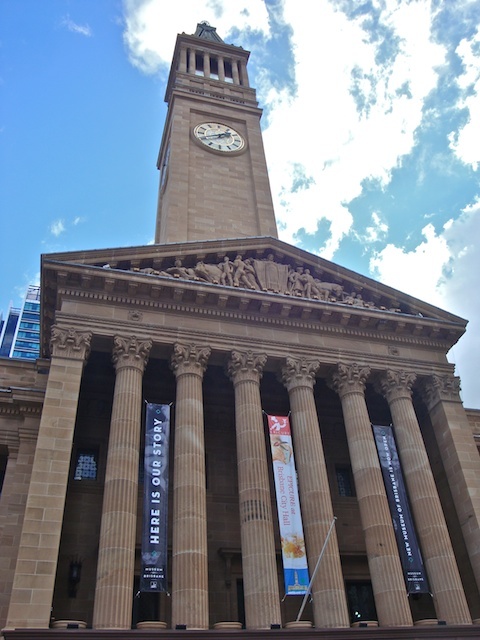 We had lunch and then visited the newly renovated City Hall and its Museum. 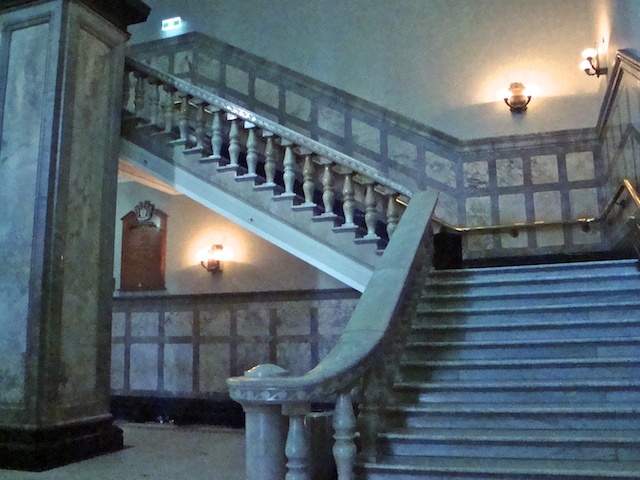 We entered the City Hall's impressive foyer with its marble staircases on both sides. However we went by lift to the 3rd floor where the Museum is located. It is possible to go on a tour to up the clock tower but we would have to wait over an hour so we gave that a miss. 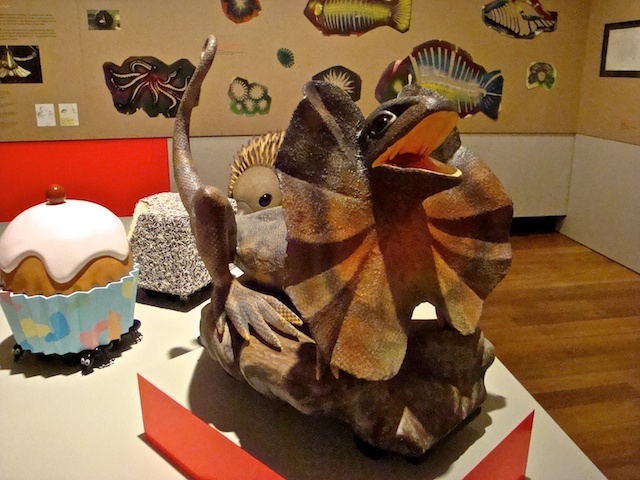 The two exhibitions on now are 'Light Fantastic: Expo 88 Parades Rewired' and 'The River'. TOH and Joan walking from one gallery to another past a rest area. 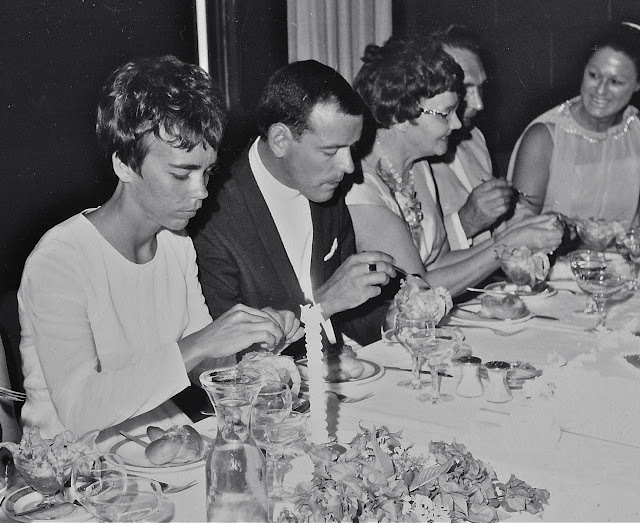 We have known Joan and Norm for 50 years. 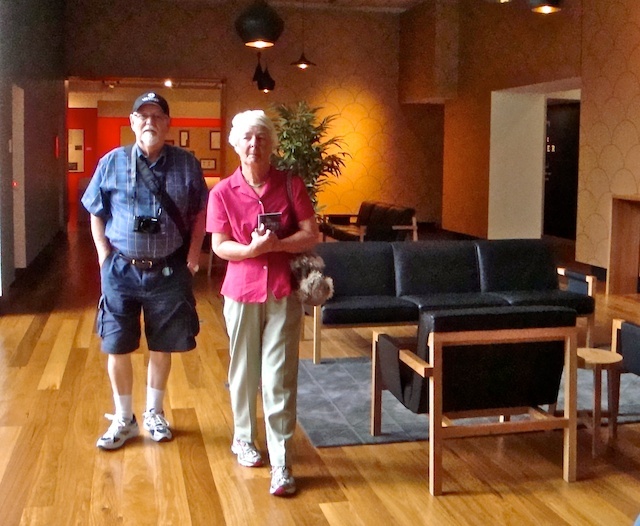 .Joan and I taught together in Papua/New Guinea and we have kept in contact ever since by attending concerts together or visiting museums and galleries. 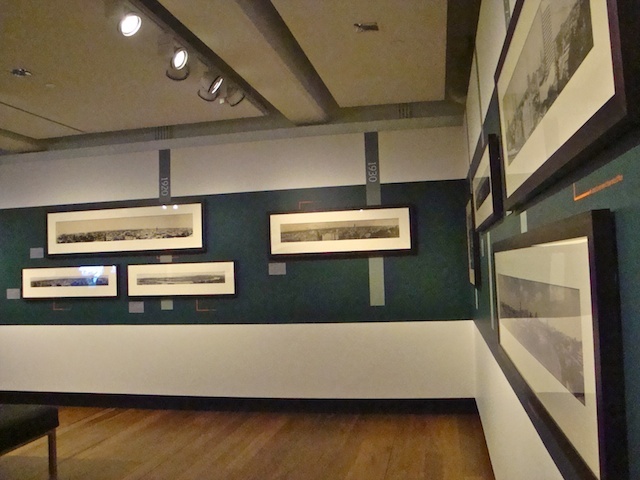 Amazing panorama photos span 150 years of our city's growth. 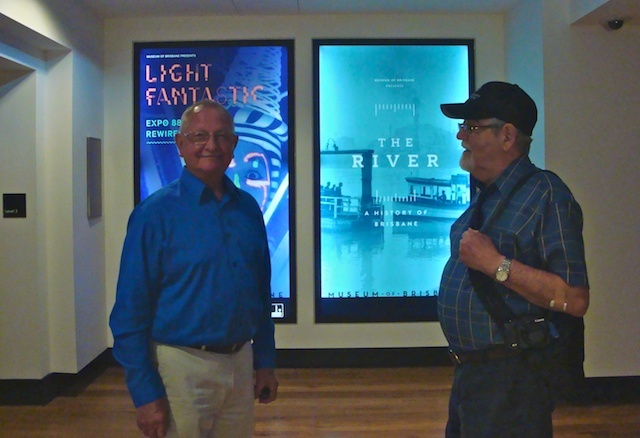 There were paintings, photos, models and videos showing the history of Brisbane and our relationship with the river. Models of a few of the floats in the parades. COLOUR COMES INTO MY LIFE. 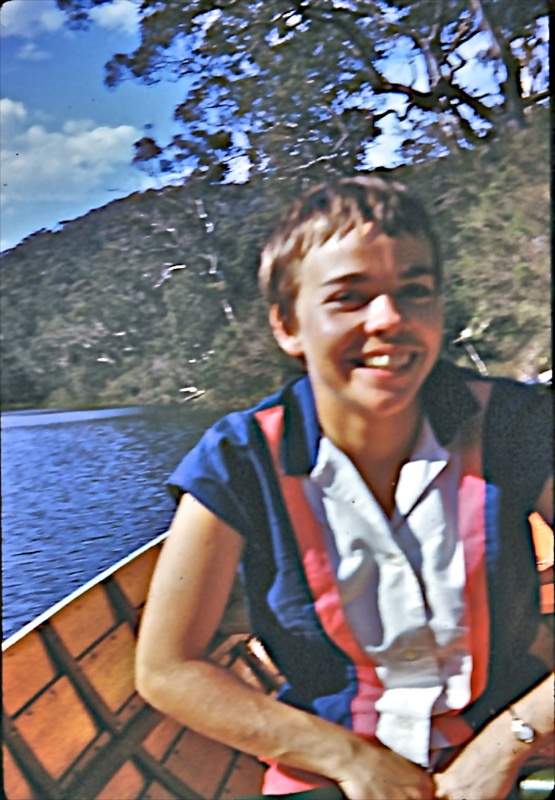 In 1961 I was working as a lab assistant. I saved my meagre wages, about 20 pounds a week from memory, to buy a Voigtlander colour slide camera. So now my life story will continue in colour. In a way I am sad because the old B&W photos did give the feeling of age about them and they are easier to scan. 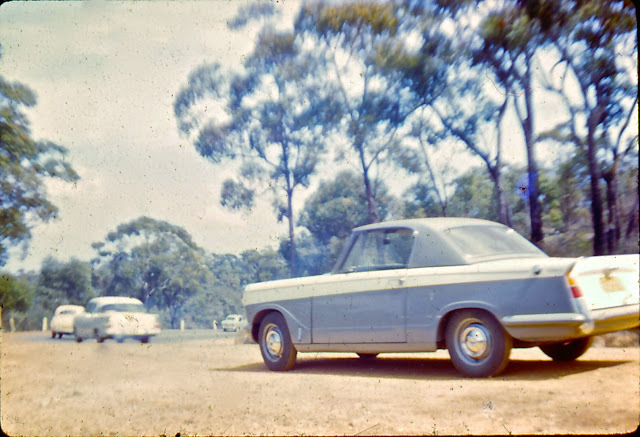 Also the colour slides have deteriorated more than the B&W prints. However, I thought I was lucky then to have a state of the art camera at 19 years of age. 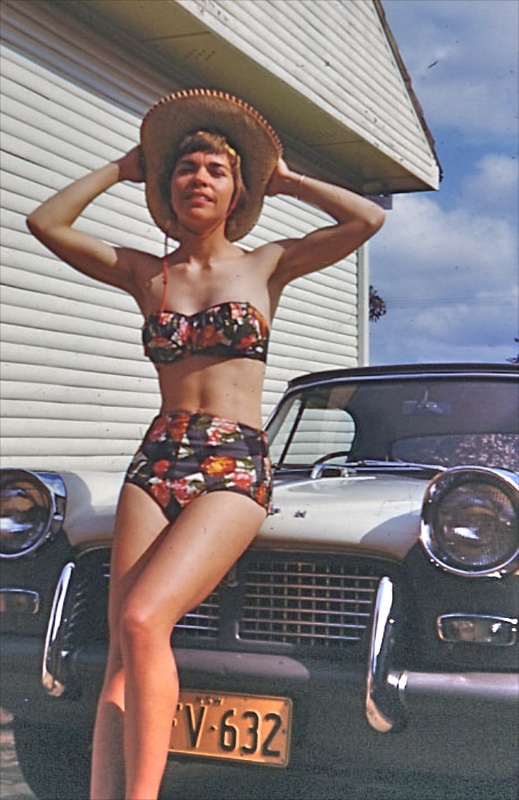 I was still living at home in the house my parents built themselves in the early 50's. Now they were repainting the weatherboards, changing them from varnished mahogany to a coloured paint. We didn't like it as much as the natural deep red timber but it would be easier to maintain. My mum was still working as a nurse and on her days off she enjoyed pottering in the garden. 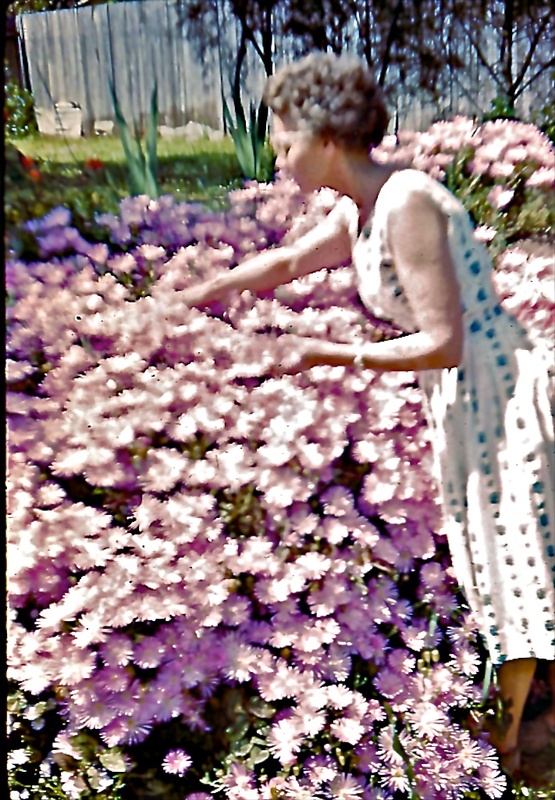 She grew a beautiful big succulent over the natural rockery. Its nick name was "Pig Face." The car in front of the house was the one my brother rented to me for a year while he returned to TPNG for another year before he would return to do a 12 month course at the Australian School of Pacific Administration. 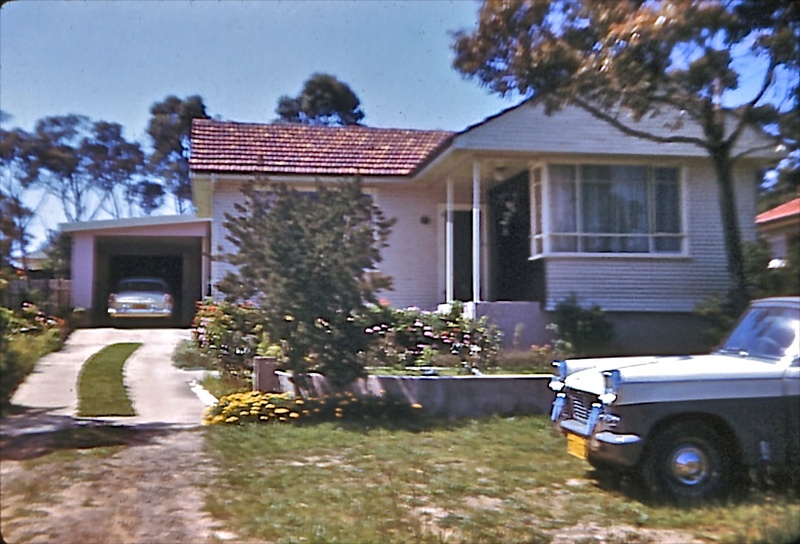 The rent was to be looked after by my Dad and used to pay for registration, insurance and services. Needless to say I was thrilled to have a car of my own. Not many girls did in those days. On the way to Newcastle to see my boyfriend LB but it was a disappointing trip. He didn't seem to love me any more. So I enjoyed going out with my girlfriends in the car. We went to the Royal National Park and hired boats to row. I just thought that I was the "Ants Pants".